I have been throwing a bump of roving into the dye pot at a rate of about one a day, just to get some stuff dyed. I had the intention of putting it in my etsy shop, but I like them so much I think I will be keeping them. The bottom one is inspired by dandelions. I am thinking of submitting it to the Yarn Museum Flora gallery if I get it spun in time. Even though I have deprived you of the opportunity to shop for roving, if you really want to do some shopping, I have somewhere to send you. Threadless. Hurry over there cause they are having a $10 sale. It would have helped them identify the 8 planets in the solar system for their midterm exam. Yes, college students in a class called “the Planets” missed that question. 6 Responses to "Stuff for me." Not that I don’t like your knitting posts. I love them. But this post totally reminded me of why I read your blog. You must be the geologist. I’m in love with the chalkboard sheep. Needs to be a t-shirt. I wouldn’t want to give up those rovings either, especially the blues and browns. And the purples with just a hint of blue. Dandelions is pretty nice, too. Oh hell, keep ’em all! 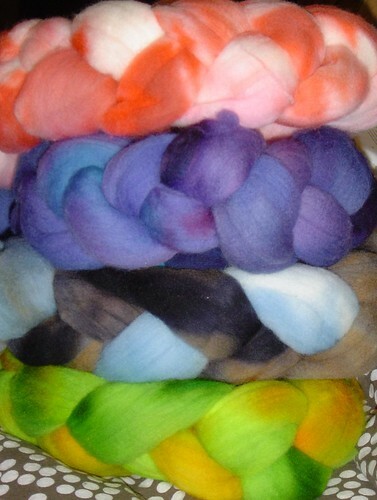 I’m going to have to do some dyeing this weekend, I can see that already! So, I just bought 2 threadless shirts, and I believe I have you to thank for making me cool again 😉 I love that site! yes, the specks of blue on my granite seem that blue in certain light. Most of the time the whole thing is a dark gray but I picked it out at ABC granite in San Leandro particularly for those occasional blue flashes.